Two 1940s classics by Billy Wilder, one of the most acclaimed filmmakers of the studio era, are coming to DVD for the first time ever from Turner Classic Movies and Universal Studios Home Entertainment. 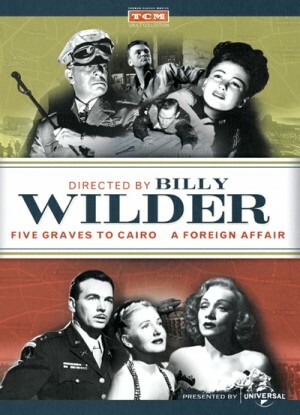 The two-disc "Directed by Billy Wilder" set includes the wartime espionage thriller Five Graves to Cairo (1943) and the delightfully cynical comedy A Foreign Affair (1948). Phoebe Frost (Jean Arthur), an upright Iowa Republican member of Congress, travels to Berlin to look into reports of corruption among the occupying American forces. She enlists an Army captain (John Lund) in her crusade and finds herself falling for him, unaware that he's the man romantically involved with a German cabaret singer (Marlene Dietrich) who can lead army investigators to a high-level Nazi war criminal.